Just for Ponies has one of the largest selections of pony blankets on the web! We can help you find the perfect blanket that will fit your pony and match your needs and budget. You can read more about Pony Blanket Sizing or contact us and we'll guide you through it. 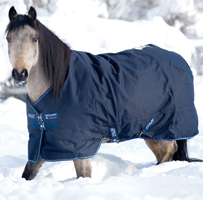 We work with the major manufacturers to get the sizing right and we try many of the blankets on our own ponies. You'll see some of our Welsh ponies used as models for the product images! Whether you want a stable blanket, a light turnout sheet, a medium weight turnout or a heavy turnout blanket, we have them in stock. The new blanket liners from Horseware give you even more flexibility. We also have blankets with attached or detachable neck covers or high neck blankets and sheets for additional protection.